Earlier today, my boys, ages 2 and 4, played in the mud pit in our backyard. This mud pit used to be a beautifully landscaped flowerbed with lilies and irises. Then we moved in and life got busy. The worn-down fence is missing some slats and there are weeds everywhere. Toys are scattered throughout the dirt. Shovels are sticking out in random places. Ugliness aside, it’s a happy place. If you ask the boys, it’s the happiest place at our house. So, they played today and I did what any parent would do–I grabbed my phone to take some pictures. I was very careful not to take any pictures that showed the weeds or the fence or even the pile of dog poop nearby that I hadn’t picked up yet. The boys were jumping in a mud puddle and laughing. And I was carefully walking around looking through my lens to be sure I captured only what I wanted people to see. 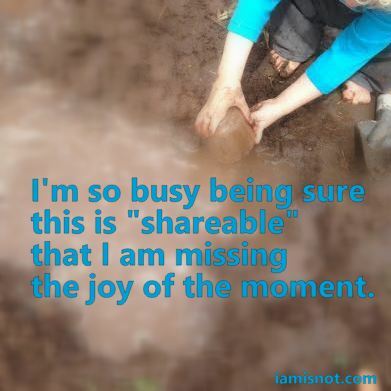 I’m so busy being sure this is “shareable” and people see only what looks good that I am missing the joy of the moment. And then I was convicted. This is what we do in our spiritual lives, too! We make sure our relationships with God appear picture perfect instead of making sure our relationships appear authentic and flawed. I want to be sure you know I took food to someone today. I don’t want you to know I haven’t actually prayed about their situation yet. I want you to see my family all dressed up and at church. I don’t want you to know I yelled at them several times this morning. I want you to know I am reading my Bible. I don’t want you to know it ‘s the first time in a few days. Can you relate to any of this? Let’s look through the lens today and take in the whole picture. And then let’s share it in vulnerability and authenticity. I don’t want to lose the joy of the moment or the blessings from it. Amen??? I shared the picture on fb. The one without the dilapidated fence. Or the poop. Or the weeds. But now you know they were there. And, I’m probably not fixing any of it today.